Edward Pilsbury served as a second lieutenant in the 12th Maine Infantry, Company C during the Civil War. Pilsbury was 28 when he mustered in as a sergeant on November 15, 1861, in Portland. He rose through the ranks during the war, eventually being commissioned captain on December 12, 1864. Pilsbury, born in Biddeford, was a resident of Scarborough in 1861. At the time of his enlistment, he was described as having a dark complexion, hazel eyes, dark hair, and was six feet, one inches tall. Pilsbury, a seaman by trade, was the oldest of nine children of Charles Carl and Eunice Waterhouse Pilsbury. 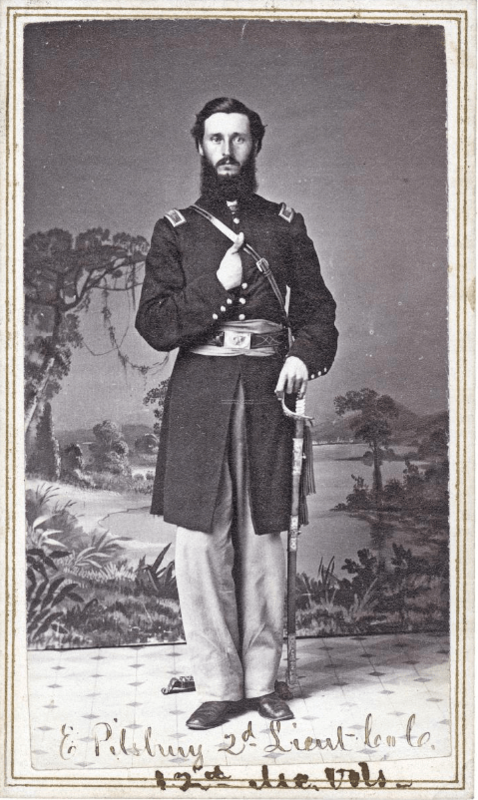 The 12th Maine regiment was mustered out on December 7, 1864, but Edward Pilsbury continued to serve as part of military district #21, stationed in Savannah, Georgia, to help with the reconstruction of the South after the end of the Civil War. The 1870 census dated 29 June shows Pilsbury was still in Savannah at that time. However, the 1870 census dated 9 August shows Pilsbury back in Scarborough in the household of his parents Charles and Eunice. Pilsbury died of consumption in Newbury, Massachusetts on July 20, 1878 and is buried in Scarborough at the Dunstan Cemetery. This entry was posted in People, They Answered the Call. Bookmark the permalink.